Christine Feehan is so tried and true for me. In this case, Covert Game is the next in the Ghostwalkers series and follows the story of Zara Hightower. (Who is friends with Bellisia from the previous book). Zara is not like the other women in previous stories, she’s more reserved and actually comes off as slightly defeated by life. However, that may have to do with the fact that in the first 3 chapters she’s tortured harshly by a Chinese Operative. So, WARNING – if you are triggered by violence, abuse, or torture – please skip this book as it deals with government missions and imprisonment. If you’re new to the GhostWalker series, this is about enhanced humans. Those that have been modified in various ways to perform missions for the government. Zara is no exception and certainly the hero Gino isn’t either. Zara is not a great operative. She doesn’t handle pain well, she’s not eagerly waiting to fight. In fact, she’d rather not. I’m pretty sure she’d love to be reading a book somewhere remote with a computer to tinker her days away with. And I enjoyed their story. Good things come first~ I liked that we changed it up with Zara. I myself had trouble relating to her but I know people like her. People that would prefer to take to the sidelines and have a different type of life. Now for the bad things~ Gino was a little much for me. He was, but it didn’t deter me from the story in the long run. I enjoy the intricacies of the plot WITH the romance involved. If it had just been the Gino and Zara show, I think I would have been off put. 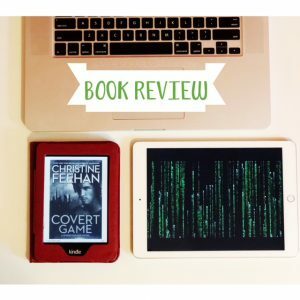 Overall, if you like paranormal romance you can’t go wrong with Covert Game. Even if you’ve never read a GhostWalkers series book, you can pick this book up and not be totally lost.